The Trialogue Business in Society Conference is an annual industry-leading event which brings together development stakeholders from the corporate, non-profit, government, academic and media sectors to share lessons and innovations for enhanced and lasting impact in development. 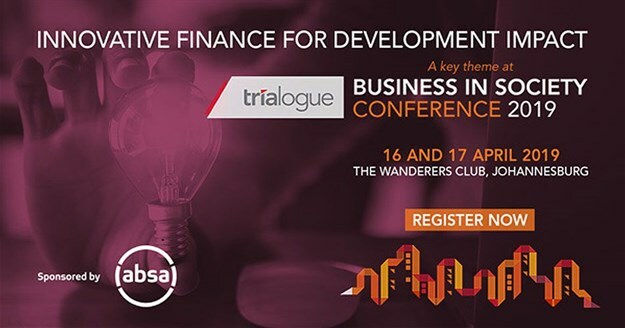 One of the four key themes at this year’s conference – innovative finance for development impact – presented in partnership with Absa, will explore the variety of models that can be used to fund multistakeholder approaches to address a range of socioeconomic challenges. Delegates can look forward to expert insight from Absa, The Bertha Centre for Social Innovation and Entrepreneurship, Greater Impact, Harambee Youth Employment Accelerator, Synergy Global, Yellowwoods, among many others. Innovative finance sessions will focus on the impact opportunities from blended finance, understanding alternative credit models and managing risk, the range of innovative finance tools available, how innovative finance can improve organisational sustainability, and how corporates can contribute to strengthening social infrastructure. Other conference themes are collaboration in education, presented in partnership with Old Mutual, managing risk and reputation in development, presented in partnership with Sasol, and building healthy relationships in development, presented in partnership with Vodacom. The conference is a creative space in which stakeholders in development can come together to share challenges, lessons and innovations to improve large-scale and lasting impact in development. With the 2019 conference taking place less than a month before national elections, the keynote address by lifelong activist and former Concourt judge, Albie Sachs, intends to remind South Africans of the progressive Constitution upon which this democracy was built. An international keynote address by the executive director of the UN Global Compact Malaysia, Shahazar Yazid, will offer perspective on how South Africa is fairing in its response to the global Sustainable Development Goals. In addition to 22 content session and insight from more than 55 expert contributors, delegates can also look forward to several networking opportunities, including registration sessions sponsored by Rand Water Foundation and a cocktail networking function on the first evening of the conference, sponsored by MTN Foundation.